It was highly anticipated last year by eSports fans and those getting into it. This year it began again, reworked and better because of it, and now it raises questions. Blizzard’s newly integrated “Overwatch League” has found its way into popular broadcasted eSports. It consists of 12 teams, each based in a city and having rosters of six or more players. Blizzard hyped up the OWL, and in turn received a $90 million offer by twitch.tv for permission to stream it. However, there was questioning. Across all 12 of the teams’ extensive rosters, many popular professional players were missing, and there were no women. Specifically, people questioned the absence of world-renowned Zarya player Kim “Geguri” Se-yeon (also known as 개구리, or frog135 on Twitch), a Korean player who is so good at what she does that she received accusations of hacking from other popular players, namely Yeon-oh “fl0w3r” Hwang, a former Overwatch World Cup player for team South Korea. Currently, fl0w3r is in the inactive roster for the New York Excelsior, as he is too young to officially participate in the current stages of the OWL. So why is it, fans wondered, that fl0w3r would be on a team, and not Geguri? She also had a professional background for participating in South Korea’s APEX tournament. Interviewers questioned some of teams as well as Geguri herself on the matter. There were valid arguments, such as that language barriers could potentially be a hindrance to team play. Another argument was that team housing would be an issue, as the male players might harass her; Blizzard recently added a set of rules in regards to this claim as well as in light of the Stage 1 ban of Dallas Fuel’s Félix “xQc” Lengyel. The Houston Outlaws’ manager Matt Rodriguez, according to Kotaku.com, suggested that it would be a bad business move to sign Geguri because “it would be viewed as a PR stunt.” While a true statement, how would having the first female player in the OWL on your team be bad PR? Probably only if you left her on the bench. The Outlaws’ Jacob “JAKE” Lyon claimed that “People would always be doubting, always be judging. So it has to be the right person, the right player, and those things have to come together at the right moment—which makes it especially hard for women in the scene right now,” as said on Kotaku. Although he is wrong in the regard people would undoubtedly by judgmental, there is no way to fix that simply by excluding women from professional gaming, and by extension casual gaming in general. If not now, when? If not her, then who? And so it is. Geguri was recently announced to be participating in Stage Two of the OWL. Although female fans rejoiced at this, Geguri said that she did not want to be recognized for being a woman, but rather as a good player. Many at first anticipated that she would be joining the leading team in map wins, NYXL, due to the fact that she said she would be joining a “foreign team” and NYXL has space in its roster for a new off-tank player. Since the NYXL is based in New York but still has a full Korean roster, she would have been on a foreign team but with no language barriers. It came as a shock to many when she revealed that she would be joining the Shanghai Dragons, the team currently in last place in both map wins and match wins. Thus far, the SHD have not won a single match, and have gained very few maps. Additionally, Geguri along with the other Korean players being added to the roster (Eui-Seok “Fearless” Lee and Gi-hyeon “Ado” Chon) will have to learn Mandarin in order to be able to communicate with their teammates. She is also currently learning English, adding to her already tall order. Many fans of the OWL are excited to see Geguri enter the league, not only as a female player, but as a good enough player to potentially take the SHD out of their losing streak. Roster changes and additions in the OWL all happened in the beginning of the Stage Two on Wednesday, Feb. 21; However, the additions to the SHD have been delayed due to issues with the players’ visas. Because of this, Geguri and the other Korean and Chinese players will not be participating until the later weeks of Stage Two. 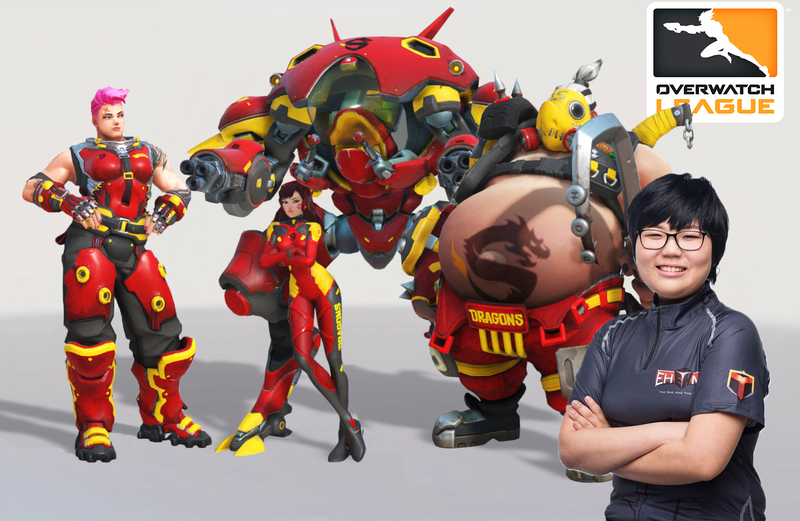 It is great for inclusivity in gaming to have new representation in the form of Geguri, reflective of Overwatch’s own D.va as a professional Korean female gamer. Of course, it is also great that she happens to be a darn good player! Hopefully, more inclusion of women in professional gaming could lead to more acceptance of women in gaming in general. Hopefully, harassment of players will cease regardless of what they sound or look like. Many have been cheering on the Shanghai Dragons, as the very clear underdogs in the tournament due to management corruption and frequent poor team synergy. The addition of these top tier players may likely turn the tide for Shanghai. Viewers will see in the coming weeks, as the the second stage of the Overwatch League continues Wednesday through Saturday each week until Sunday, March 25, the day of the Stage Two title matches. The OWL will then take a break before entering into Stage 3 which will begin in April. Should you wish to watch the matches yourself, they play on the Overwatch League’s official website (https://overwatchleague.com/en-us/), on twitch.tv, and at the Blizzard Arena in Los Angeles starting at 4 p.m. Wednesday through Friday and at 1 p.m. on Saturdays.